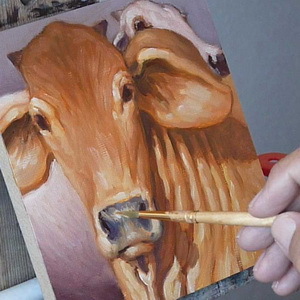 Working on a Daily Auction original oil painting. Every day, John Farnsworth will be posting a new 6 x 6 inch oil painting to this blog. Bookmark our site A Farnsworth A Day, and come back August 01, 2010 for our daily email auction. Or sign up now to receive updates and a fresh new image each day direct to your email. Bidding will open at midnight (MST) Mountain Standard Time, and close twenty four hours later. A free 6 x 9 inch original watercolor will be awarded to the highest bidder during the month of August. Please pass this on to a friend and remember, these little gems make terrific gifts. When in Santa Fe, you’re invited to come visit the studio. Simply call 505 982-4561. We look forward to meeting you, and each visitor goes home with a nice gift!